A great vintage spared by the drought. The nose is deep and complex, a hint of iodine, rich in exotic fruit with oriental spices. The mouth is suave and elegant without any astringency. To be cellared while it softens. A very nice nose distinguishes this vintage, all in finesse. On the palate this wine shows great complexity, perfect balance between freshness and powerful ripe fruit, softened by very round tannins. An elegant wine which can be enjoyed now. An enjoyable nose with complex aromas of red fruit, spices and garrigue along with subtle notes of truffles. A pretty ample and balanced palate, together with tannins of great finesse that show a beautiful length, representative of this great vintage. A very aromatic nose and a beautiful balance between freshness and spices. This wine can be drunk now but will also gain if you wait a few more years. Stand the bottle upright 48 hours before serving to avoid any deposit. 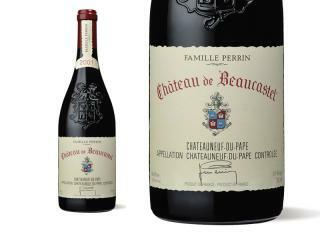 Still incredibly youthful and a touch reserved (especially when compared to the ‟00), the 2001 Château de Beaucastel Châteauneuf-du-Pape still needs another 5 years to truly shine. At present, it delivers a dense, pure bouquet of meaty dark fruits, game, ripe herb, and licorice, medium to full -body, brilliant concentration, and a long, classic finish. This gradually opens in the glass so if drinking anytime soon, a short decant or longer double decant is recommended. Much more developed than the 2005. A lot more undergrowth and leather and tertiary characters. Very leathery on the palate but not at all lean. No primary fruit remaining but the fruit flesh is still there. And the tannins still surprisingly present. Beaucastel has been on a terrific qualitative roll over the last four vintages, and the 2001 Chateauneuf du Pape (which Francois Perrin feels is similar to the 1990, although I don’t see that as of yet) is a 15,000-case blend of 30% Grenache, 30% Mourvedre, 10% Syrah, 10% Counoise, and the balance split among the other permitted varietals of the appellation. This inky/ruby/purple-colored cuvee offers a classic Beaucastel bouquet of new saddle leather, cigar smoke, roasted herbs, black truffles, underbrush, and blackberry as well as cherry fruit. It is a superb, earthy expression of this Mourvedre-dominated cuvee. Full-bodied and powerful, it will undoubtedly close down over the next several years, not to re-emerge for 7-8 years. Quelle fraîcheur pour ce 2001, produit de l'agriculture biologique ! La robe est d'un rouge franc avec des nuances violines. Le nez est jeune avec des parfums de fruits frais et de cuir qui s'harmonisent bien. Le fruit (fraise, cerise) se retrouve en bouche sur une très belle base tannique. Un bon équilibre, de la chaleur et une note vanillée composent une bouteille à conserver une décennie. Medium to dark ruby in color this wine smells of wet stones, bright cherry and raspberry fruit, with a hint of woody forest floor and dried flowers. In the mouth muscular, but supple tannins wrap around a core of cherry and raspberry fruit scented with cedar and crushed green herbs. Gorgeously balanced, with mineral and earth on the one side, and bright juicy acid and fruit on the other. Long finish, outstanding purity. Wow.